The circuit diagram above shows the connections for the power and audio. The lengths of the connections are not exact and mostly ment to visually represent which pin goes where. It's best to use this as a reference for pins. The slide switch is wired to pin GND and EN. The 2000mAh lithium polymer battery is connected to the JST port. The #2(5V) and #6(GND) connections represent the wire number from the Pi ribbon cable. The VIN and GND pins are wired to the 5V and GND pins on the powerboost 1000c. The A+ and A- pins are wired directly to the audio pins on the bottom of the Raspberry Pi A+. The speaker is wired to the amps audio output (+ and -). To interface the Pi with the tactile buttons, we'll use a Pi ribbon cable (26 pin). The connections below indicate the wire number, gpio name and keyboard input controller button. 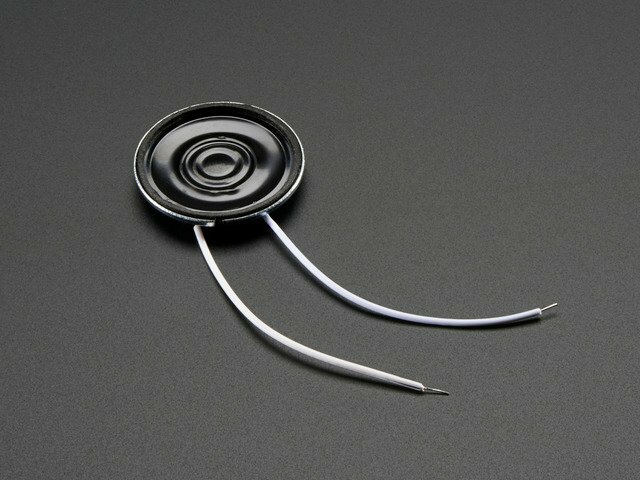 The White colored wire will be represented as Wire #1. The blue connections indicate the ground for each buttons. These are all wired to the bottom ground rail. There is five buttons that is connected to the PCB near on the bottom of the display. 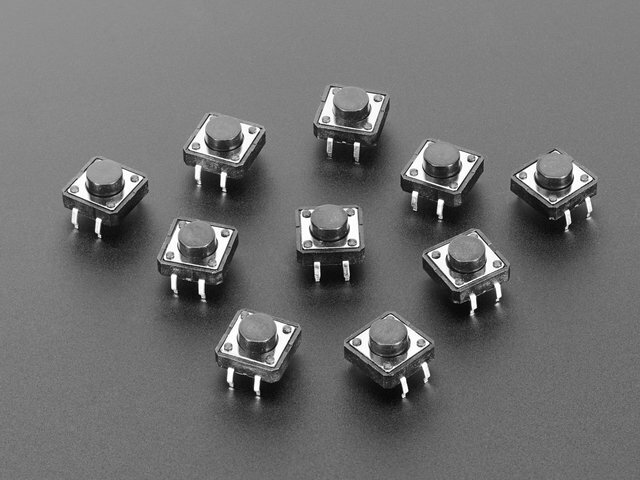 The GPIO number for these buttons are listed below and on the PCB. The four button version uses the same wiring from the Pi Cable, except two extra wires need to be connected to the Perma-proto PCB. The diagram above shows which buttons are connected to the perma-proto PCB. 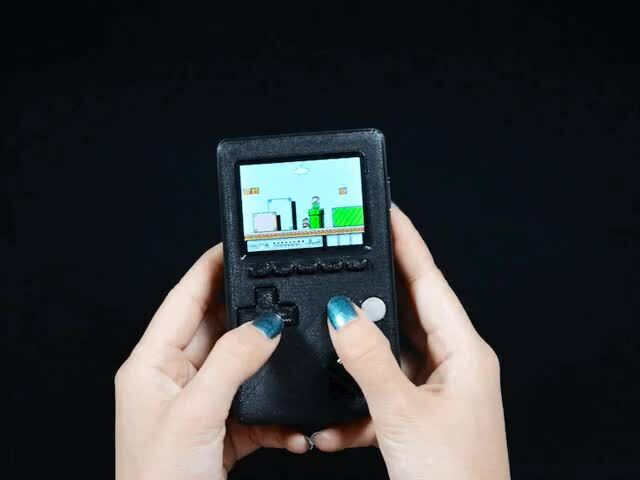 Ideally, I want to say you can customize and change it up, but then the buttons won't fit in the cutouts on the 3D printed enclosure - so if you wanna change this layout, you'll also have to update the CAD, so keep that in mind. To make the wiring a bit easier, we're using a Pi ribbon cable (the 26-pin one). This cable as a nifty connector that fits perfectly on the GPIO breakout on the 2.4" PiTFT. We'll remove the connector from the other side and wire that up directly to the buttons on the Perma-Proto. The parts are optimized to print as is, oriented centered on your printers build plate. The parts will fit on any printer with a minimum bed size of 120mm x 70mm. The settings adove are for reference. You're encouraged to slice these files for your printer using your preferred slicing software. No raft or support material necessary here. The overhands are small enough that it doesn't present any problems with most FDM 3D printers. 3D printers tend to vary from one another, so it's no surpise that one printer makes parts tighter than the other. That slight 0.1mm difference is enough to make things not fit exactly. Maybe the mounting holes are too tight, or the speaker doesn't fit. If that's the case, you can loosen them up with a filing tool or adjusting the faces in the CAD model. We tested the parts in PLA, ABS, BambooFill and CopperFill. You're can use whatever material and color you want to use in this project. Minimize warping by using blue painters tape. Apply gluestick or aqua net hair spray on a glass plate if applicable. If you're using a heated bed, be sure to enclose the printer to avoid air drafts. The first layer should be as thin as a sheet of paper. Kinda of hard to see but here's some stuff to look out for. If you see the layers are not fully bonding together, the nozzle is too far from the bed. If the layers are overlapping, the nozzle is too close to the bed. Ideally, you want to baby sit the first layer to ensure your bed is leveled. If your printers bed can be adjusted with thumb screws, you'll want to perform leveling "live", while the print is taking place. If you're using a z-probe with auto-leveling, you'll have to manually offset your z-height in gcode. You can use TPE flexible filament for the buttons. The flexible filament works really well here because it gives you a bit of flex and grip when you press the buttons. PLA, ABS and other hard plastics will work just fine for the D-PAD but it might not work so well with the A+B and PiTFT buttons. If your new to 3D printing and wondering: how did you get such a nice print? It's mainly because the bed was leveled really good and the slice tool path is clean. When you're slicing parts, it's a good idea to check the toolpath and see how the nozzle is generating the walls in the part. Ideally you want to adjust your settings so that the walls are being printed with no infill and just the shells. This makes the wall appear really clean. Don't be fool by the photos though, if you look carefully you can see we have imperfections and minor warped corners. We printed the blue one in ABS and the purple in PLA - The PLA parts even had a small amount of warping. The ABS part was printed on a makerbot replicator 1. Purple parts were printed on a Replicator 2. Both using makerware. In order to keep these parts closed, we used two neodymium magents to keep them shut. I recommend gluing these to the two enclosure part before starting wiring. These magnets fit inside the corner standoff located near the bottom roudned corner - you can't miss it! You can use super glue to keep them in place. Be sure to double check the polarity before gluing them! Before starting it's a good idea to get your tools and workspace suitated. You'll want to have wires, tools and solder close by while you work through the sections. The wiring portion of this build is split into sections relative to the components. This hopefully makes it a good way to take breaks when completing sections. The slide switch is wired to the Powerboost 1000c with just three wires (Vs, GND and EN). It's wired to the enable pin so that it safely discharges the powerboost 1000c. This however will not safely power off the Raspberry Pi - You'll still need to "sudo -halt p" that to do that safely. The Raspberry Pi, PiTFT and PAM8302 are powered by the Powerboost 1000c and a 2000mAh lithium polymer battery. A Pi ribbon cable connects from the PiTFT to the positive and negative power pins on the powerboost breakout board (in place of the USB port). 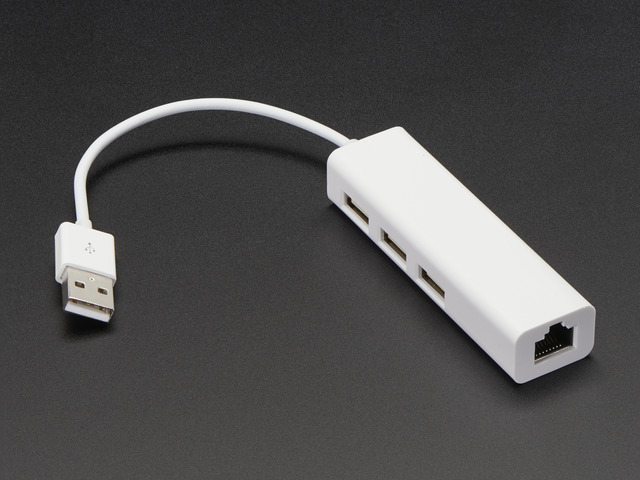 The microUSB port on the powerboost can be used to recharge the lipo battery. The lipo battery connects to the on-board JST conenctor. This 2.5w mono amplifier is powered by the powerboost 1000c (5V and G). The audio input is connected to the audio jack pins on the bottom of the Raspberry Pi. 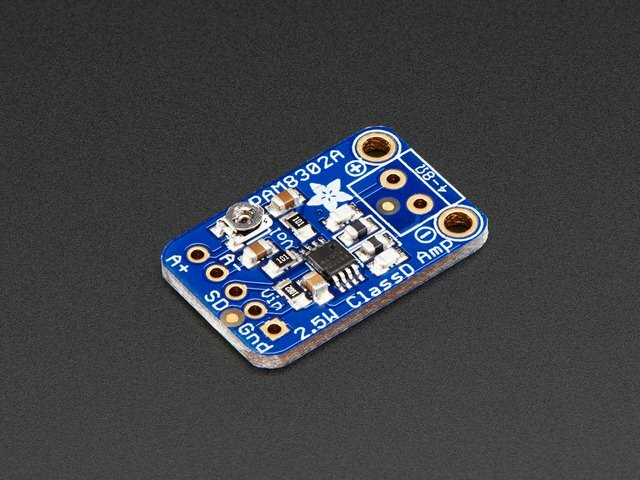 A single mini metal speaker is wired to the output on the breakout. 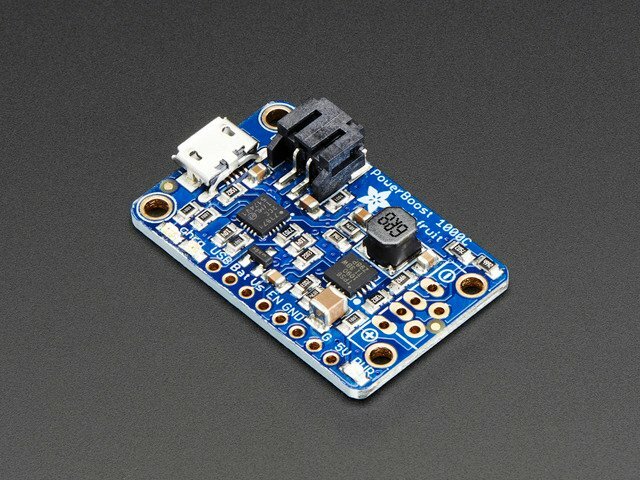 The PiTFT is designed to fit ontop of the Raspberry Pi GPIO header. The PCB on the display has a GPIO socket which can connect to a Pi ribbon cable. We'll use the Pi ribbon cable to wire up tactile buttons for the controls. The 2.4' PiTFT has five spots on the PCB for tactile buttons. Use these buttons as pause, start, L shoulder, R shoulder or even exit ROM. The display shares power with the Raspberry Pi, so that gets powered on when the Pi ribbon cable is wired up to the powerboost 1000c. 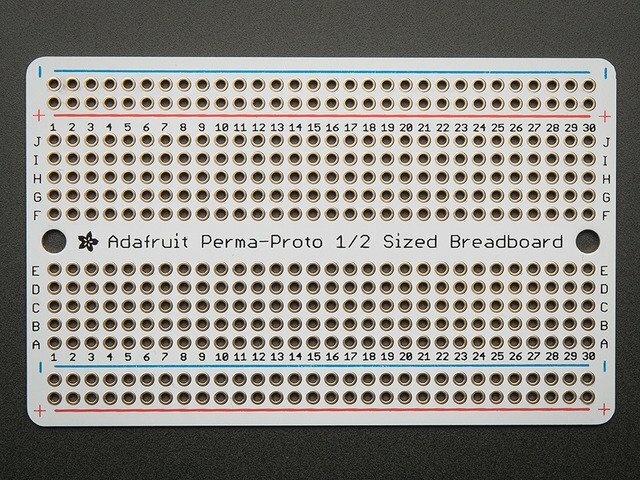 To connect our buttons we're using a perma-proto half-sized breadboard to contain them together on a PCB. The PCB will need to be cut and trimmed to fit inside the enclosure. The 6 controller buttons are soldered to the PCB. The Pi ribbon cable is wired to these buttons. The perma-proto has a power rail, so we can connect the ground together in series. Get the amp breakout secured to the panavise jr. Heat up the pins and apply some solder to all but the SD pin on the breakout. Measure and cut two 30AWG wires to about the length of the PCB. Strip the ends off each wire and tin the tips. Just like the powerboost PCB, it's a good idea to thread the mounting hole with a machine screw. We only need one hole threaded since we're using a single screw to secure the PCB to the enclosure. Secure the PCB and solder the red wire to Vin pin and the blue wire to GND. Fit the breakout over the spot near the powerboost 1000c and line up the holes. Hold the PCB in place while you fasten a single #4-40 3/8 flat phillips machine screw. Solder up the red wire from Vin to 5V on the powerboost 1000c. Then connect the blue wire from Gnd to G on the powerboost 1000c. Insert the header that came with the PiTFT into the PCB. Use a piece of fun tac to hold the header in place while you solder. Solder the pins on the GPIO to seure the header to the PCB. The solder joints should look like little herseys kisses. Remove the tac from the GPIO header. Ball it up and save it for the next project, it's served it's purpose! Insert five tactile switch buttons into the designated spots on the PiTFT PCB. They snap fit and will hold in place. Secure the PCB to a panavise jr and solder the buttons to secure them. Snip the excess leads from the buttons the PiTFT PCB. These bits are sharp and could scratch the components. By default, the 2.4' PiTFT uses GPIO 18 to turn on/off the backlight on the display. In this build we're using GPIO 18 as a input button, so we need to cut the trace located on the back of the PCB, labled #18 Lite. Use a hobby knife to cut the trace. 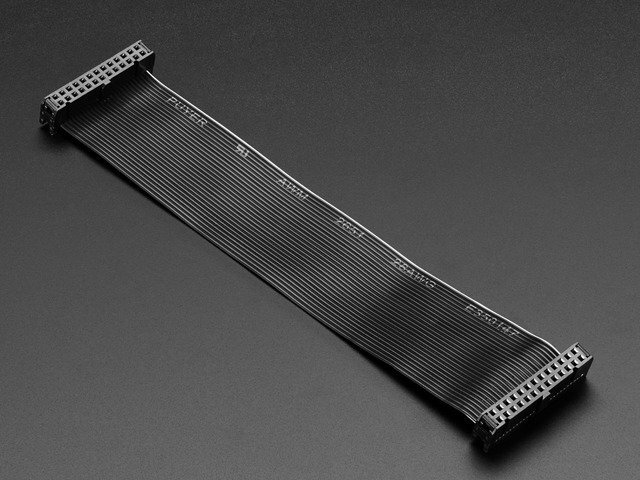 With the GPIO header and buttons soldered, go ahead and flip over the display so the two parts are side by side. Use your nail or hobby knife to peel the orange colored sticker backing. Remove and peel both pieces. 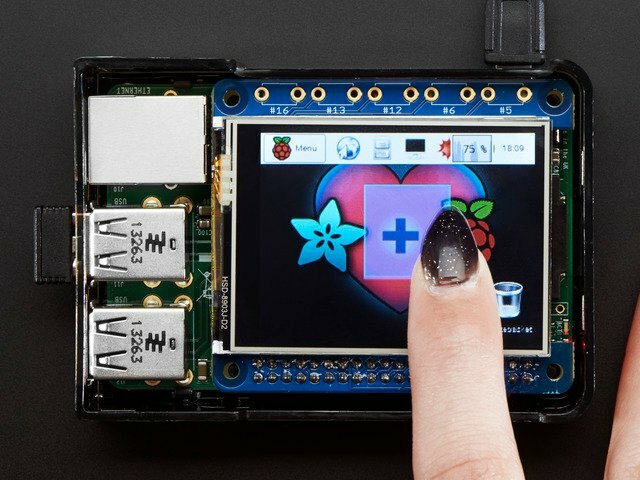 Flip over the display and line it up with the screen outline on the PCB. Press down on the screen to make the adhesive stick to the PCB. Line up the white wire on the ribbon cable with the white arrow on the PiTFT PCB. Press firmly on the connector to plug it into the pins. Grab your set of flush cutters and snip off the connector the other end. Peel apart each strand of wire from the cable like you would with stringy cheese. Peel it just enough so they're still some ribbon near the fold. Now is a good time to insert that strip of buttons printed in Ninjaflex. The buttons should fit into the cuts on the enclosure. Fit the PiTFT into the enclosure and line up the buttons and mounting holes. Grab four #4-40 3/8 flat phillips machine screws. Hold the PiTFT in place while you insert and secure four machine screws into the PCB. These should fasten all the way through the PCB and the standoffs. This guide was first published on May 14, 2015. It was last updated on May 14, 2015.